When you walk inside Smith Tower in Seattle, it’s like taking a step back in time. Built in 1914, much of the building still looks the same as it did a century ago. 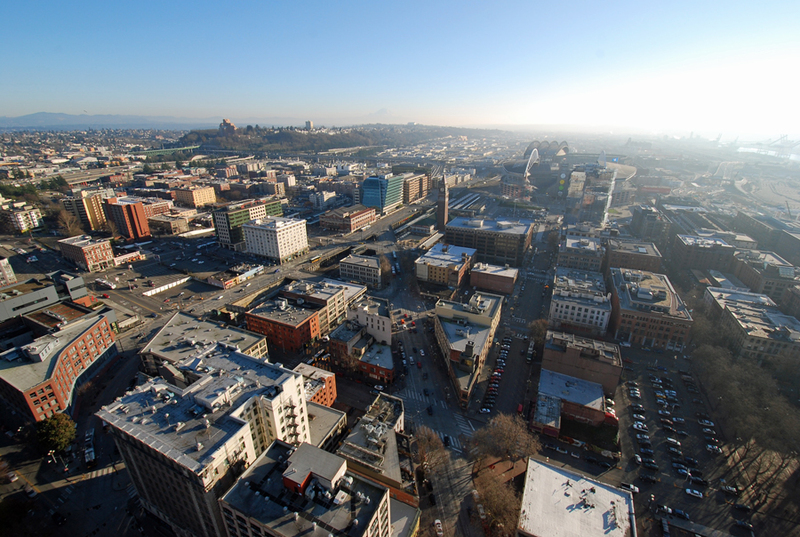 The only thing that’s changed dramatically is the view from the Smith Tower Observation Deck. Let’s just say the city has grown up a bit in the last 100 years. But, that doesn’t mean the sights from the top are any less spectacular than they were in the past. 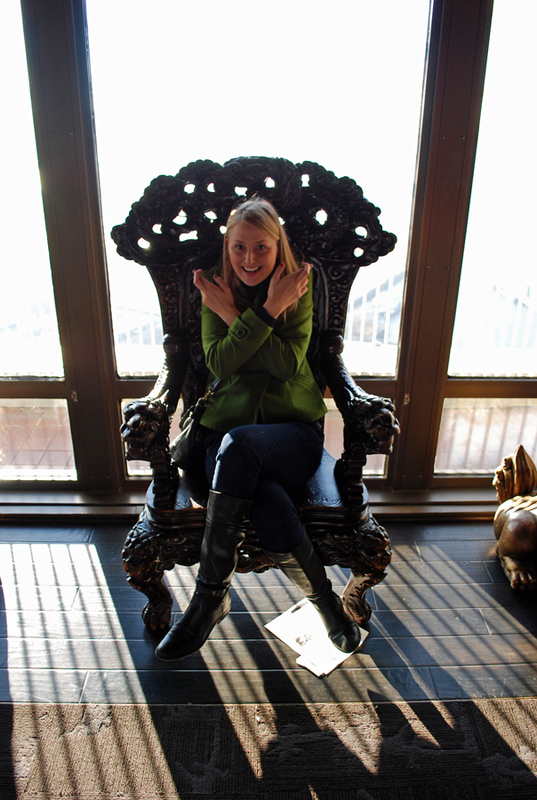 A trip to the Smith Tower Observation Deck (506 2nd Ave.) is truly an experience. I honestly didn’t expect that at all. I thought I was just going to Smith Tower for cool views of Seattle, but it was impossible to not get wrapped up in all the history: The plot of land was a drug store until 1911. That’s when it was demolished by New York tycoon L.C. 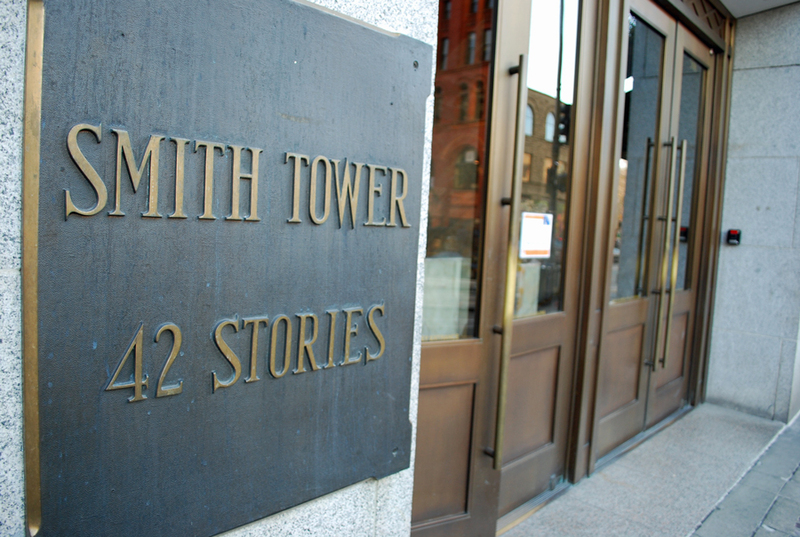 Smith to make way for a new 18-story building. 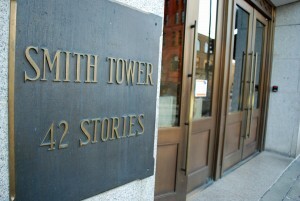 Instead of 18 stories, Smith was convinced by his son to build something much taller. When it was finished, Smith Tower was 42 stories, and it stood as the tallest building outside of New York City. 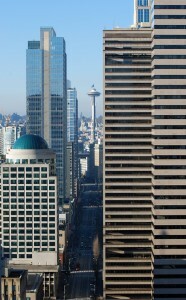 The building was the largest in Seattle for nearly 50 years, when it was finally trumped by the Space Needle in 1964. 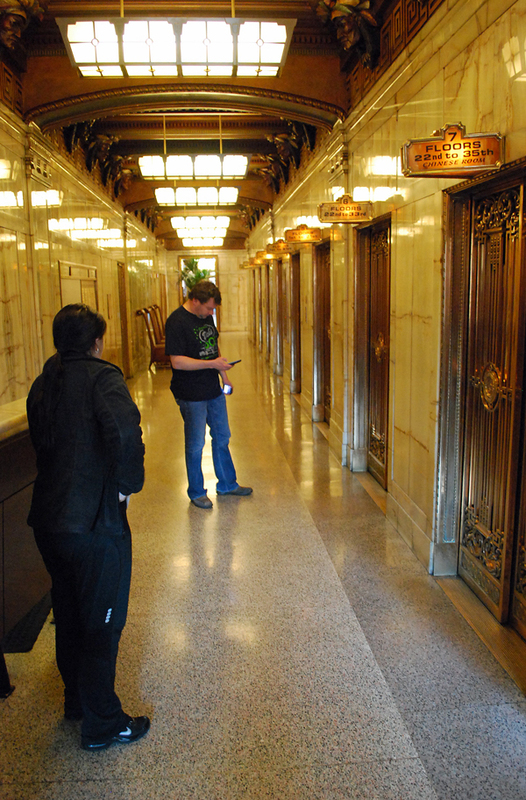 The trip to the Smith Tower Observation Deck starts with a ride on an old-school, hand-operated elevator. The elevator operator (yes, there’s actually someone who takes you to the top) explained that much of the elevator was in its original form from 1914. The elevator ride ends when you reach the 35th floor and step into the Chinese Room. Legend has it, the Chinese Room was furnished by the last Empress of China as a gift to L.C. Smith. According to the Smith Tower website, “The room’s name derives from the carved teak ceiling and Blackwood furniture that have adorned the room since its opening in 1914.” Among the items in the Chinese Room is the Wishing Chair, which is believed to be good luck for unmarried women. If they sit in the chair, legend says they’ll be married within a year (for some reason Tove really enjoyed the Wishing Chair…I’m not really sure why). 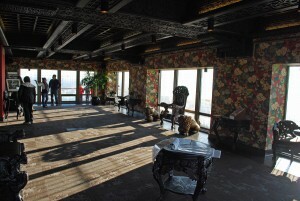 The Chinese Room is also where the Smith Tower Observation Deck fun really begins. 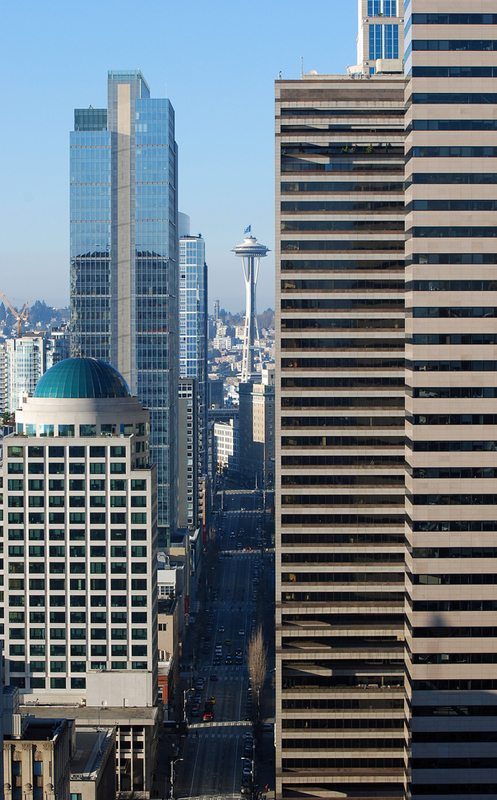 With large windows surrounding the room, you can start to enjoy some of the spectacular views of Seattle. The indoor viewing area means you can still enjoy the Smith Tower Observation Deck on a rainy day, and you can still have fun even if you’re scared of heights (like my poor mom who joined us on the adventure). Try not to miss the old newspaper clippings that show all the hype Smith Tower received in the early 1900s. It helps you understand what a big deal this building was back in the day (even though it’s often overlooked now). I suggest going outside to the actual Smith Tower Observation Deck. It wraps 360 degrees around the building, so you don’t miss a single sight from the top. 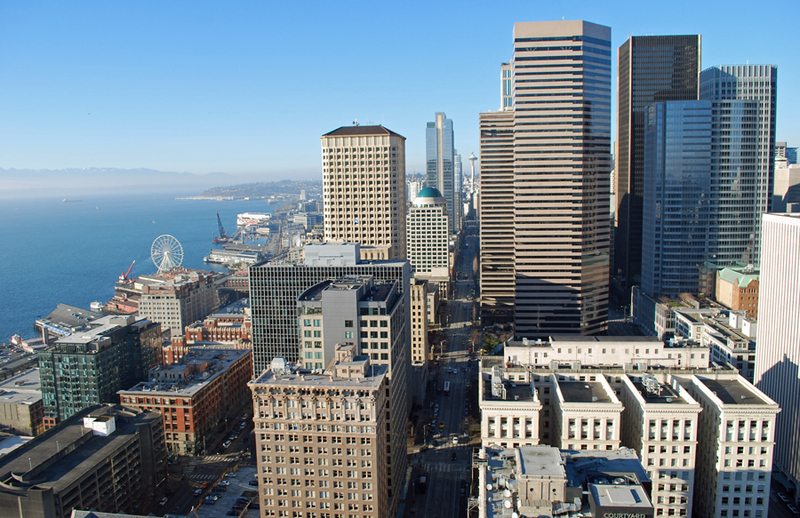 The Smith Tower Observation Deck allows you to see the Space Needle, Elliott Bay, The Great Wheel, Safeco Field and CenturyLink Field, Mount Rainier, downtown Seattle (including Columbia Center, which is now the city’s tallest building), and much more. The friendly Smith Tower employee even pointed out interesting buildings we never even paid attention to before. It was a really cool experience. While it’s not the highest view in Seattle anymore, it’s definitely the oldest. 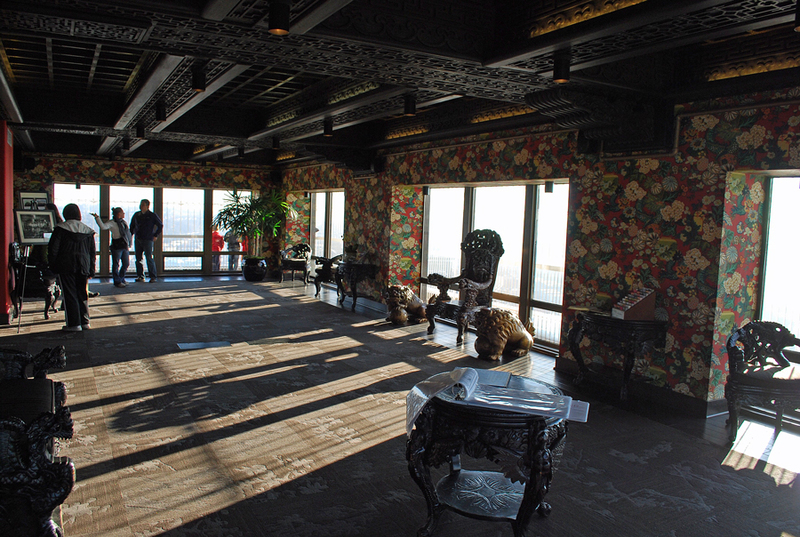 A trip to the Smith Tower Observation Deck comes at a cost, but it shouldn’t break your bank. Open daily from 10am-dusk, adults are $7.50, students (with ID) and seniors (60+) are $6, children 6-12 are $5, and kids 5 & under are free. Our trip to the Smith Tower Observation Deck was so much more than I expected. You can go to different viewpoints around the city, but none share the same history as this place. From the elevator ride to the incredible views at the top, Smith Tower offers a unique Seattle experience you truly can’t find anywhere else. Don’t miss it! Have you taken a trip to the Smith Tower Observation Deck? What did you think of the view? How about the Chinese Room? We’d love to hear from you! Please leave a comment below or connect with us on Twitter, Facebook, and Google+. 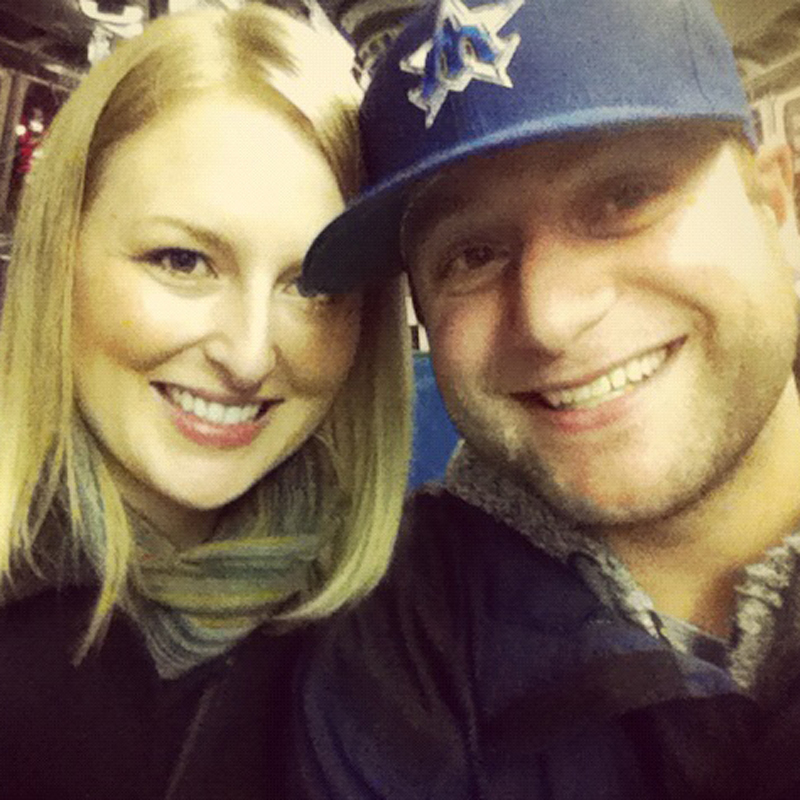 Don’t forget to also check out Seattle Bloggers for more fun places to experience in the Emerald City. I was abt 11 yrs old when my dad’s cousin got married in the Chinese rm. This was the ’80’s.we were told that the caged deck was to prevent jumpers. Us kids there got to go up to the glass bubble 4 a look, so cool! It was just a big pretty rooom. The lady that caught the bouquet had to sit in the chair.